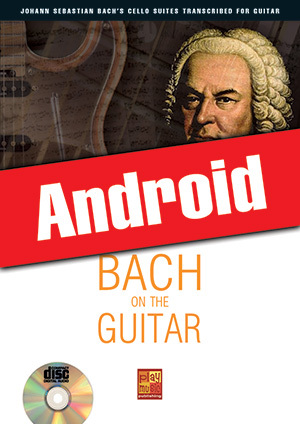 Bach on the Guitar (Android) (GUITAR, Courses for Android, Marty Lane). Between 1717 and 1723 Johann Sebastian Bach composed Six Suites for Violoncello (BWV 1007 – BWV 1012). Of these, the first three have been transcribed for guitar in this coursebook, which in itself is a considerable amount of work. For guitarists these compositions are a real challenge – a challenge, however, that brings with it a lot of benefits. Because once you get to know them, you get hooked on them and by playing them you’ll be able to considerably refine your playing technique. But believe me, the pieces are so gripping that you’ll barely notice the effort! Every suite presented in this coursebook comprises six movements. The first of these is always a prelude, followed by five dances. The CD attached to the coursebook presents every single one of the 18 movements in its full length in order to help you interpret them flawlessly.